After attending Cody Scott’s informative presentation on fishing Clear Creek on St. Patrick’s Day at the Blue Quill Angler I was anxious to apply some of my new found knowledge. Unfortunately I picked up a nasty head cold beginning on Tuesday, and the congestion was invading all parts of my head by Sunday. But it was another beautiful unseasonably warm early spring day, and I’d spent Saturday building a raised bed next to the patio, so I decided to make a short trip to Clear Creek. One of the stretches Cody mentioned was Clear Creek west of the Whitewater Park by Lawson. He assisted in electroshocking Clear Creek in 2011, and discovered that the fish density was greatest in this area. I exited I70 at Lawson and followed the frontage road underneath the highway and saw an immediate pullout on the left. I wasn’t certain this was the correct place but decided to give it a try. I initially rigged up with a Chernobyl ant and trailed a chartreuse copper john and olive midge larva. I worked my way upstream through some attractive water and noticed one small brown inspect the Chernobyl. But that was the extent of action and after a half hour of unproductive prospecting, I encountered a young man who had waded into the stream fifty yards above me. Since I was between private homes, I didn’t want to create an encounter, so I decided to retreat back to the car and search for the whitewater park. I turned left off the frontage road and drove a short distance until I saw a sign by a parking lot denoting Whitewater Park. I found a parking spot and grabbed my rod and noticed three or four fishermen already working the water in this area. The stream had been modified in this stretch to a series of perhaps twenty pools. Each pool had a short waterfall or riffle at the top, then a run that fanned out into a nice deep pool. 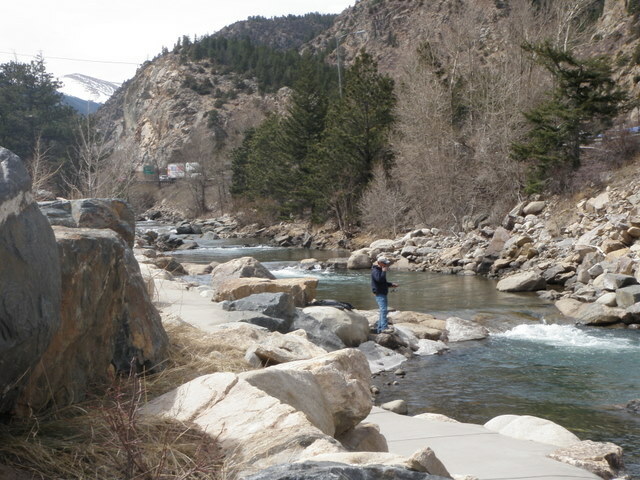 I hiked the path along the south bank and circled above the last fishermen already in the water and began fishing near the western end of Whitewater Park with perhaps five or six pool sections. I continued fishing the dry/dropper combination but experienced no action, so I decided to switch to an indicator with a weighted rubber leg stonefly nymph and reattached the olive midge larva. I worked these flies through the deep pools and thoroughly drifted the seams along the runs at the top of each pool. I wasn’t having any success and didn’t even see fish. Perhaps the fishing would improve beyond the stream improvement stretch? I went a bit beyond the last manmade pool, but continued to be thwarted in my efforts to catch a single fish. I was also observing an increasing quantity of snow and ice due to the narrow nature of the creek bed with steep banks on both sides. It was now approaching 2PM, and I was getting hungry so I decided to retreat to the parking lot. I grabbed my lunch bag and found a nice large smooth rock to rest on while I ate my lunch and observed the water. Another fisherman was prospecting the head of a pool across from the parking lot with a spinning rod, but didn’t seem to be having any success. I decided to drive further downstream after lunch to water that was perhaps warmer and more open to the sun. 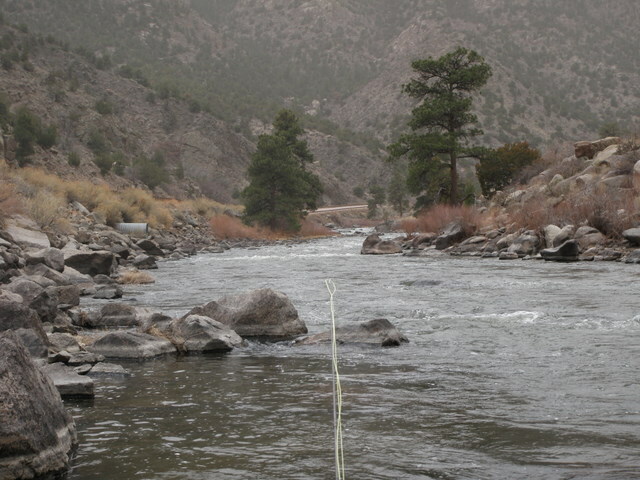 I hopped back on I70 and drove beyond Idaho Springs to the Hidden Valley exit where I’d caught my last two fish of 2011. I grabbed my rod and descended the bank next to where I parked and decided to test the wide riffle stretch down the bank from the car and then work my way upstream underneath I70. By now I’d clipped off the stonefly, added a split shot and attached a beadhead hares ear and beadhead RS2. 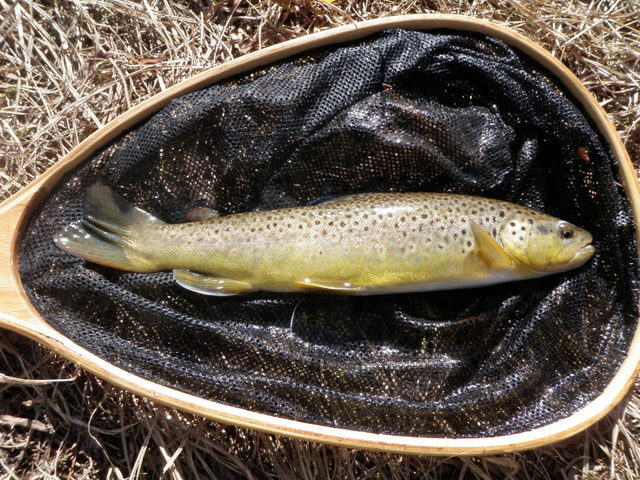 I cast across the middle section of the riffles and let my flies swing at the end of the drift and felt a tug and miraculously landed my first small brown of the day. At least I wasn’t going to get skunked. I moved up to the top of the pool, but by now some dark gray clouds moved in and blocked the sun, and I was feeling quite chilly in my fishing shirt, so I reeled up my line and climbed back up the bank to the car to add a fleece layer. 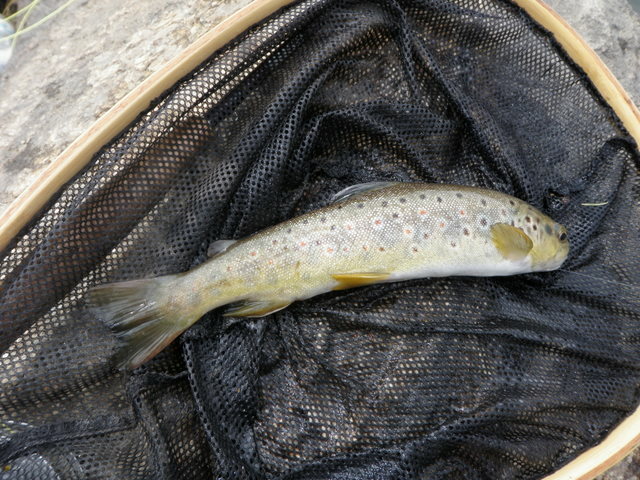 When I returned to the stream I began lower in the run and fairly quickly I hooked a second small brown on the RS2 as it began to swing at the tail of the drift. I also noticed a sporadic rise or two along the far bank. Perhaps the cloud cover had initiated a BWO hatch? I moved upstream to an area under the I70 eastbound ramp and landed two more small browns in some riffles and pockets. The fish seemed to be taking the fly just as it began to swing. One of the ramp fish took the beadhead hares ear and the other grabbed the RS2. The next stretch of water was fairly unattractive so I quickly moved to the north side of I70 and worked up around the curve behind the store that sells propane. I covered quite a bit of water with no success and then encountered another fisherman walking back along the south bank presumably to his car. We chatted a bit, and he said he’d landed a few fish on some sort of tiny tinsel fly. In a nice run just before the Central City Parkway bridge I landed perhaps my largest fish of the day, still only perhaps 10 inches, on the beadhead hares ear. I continued upstream through a narrow channelized stretch where the DOT was doing some sort of excavation. Just above this there was a long deep pool right under I70. I slowly worked my way to a position on a large flat submerged rock and observed the water. Suddenly I spotted a dimple eight feet across from me. I still had my nymphs and indicator on, so decided to switch to a dry fly. It was getting late in the afternoon, and I was considering quitting, so why not end the day by casting some dries? I tied on a CDC BWO and cast above where I’d seen the rise. It was difficult to follow the tiny gray fluff, but I believe I noticed a refusal to my fly. But as I made a couple more casts to the same general area, I observed several rises several feet out from the cement wall under the bridge and across from me. I decided to shoot a cast to that general area even though I certainly couldn’t follow my fly from that distance in the shadows of the bridge. 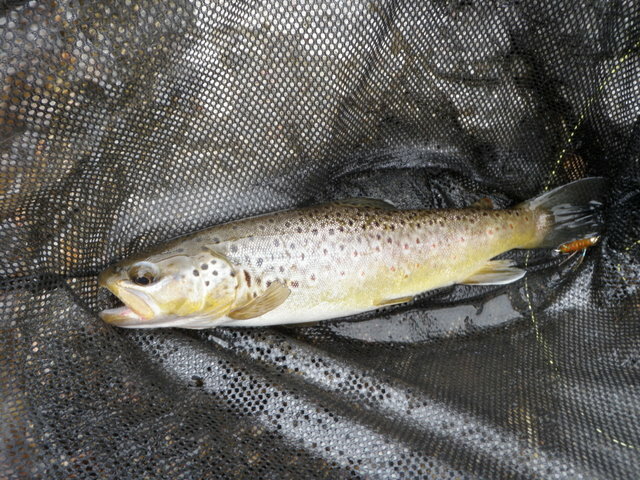 But as I watched I saw a fish sip something on the surface so set the hook and amazingly hooked a brown. 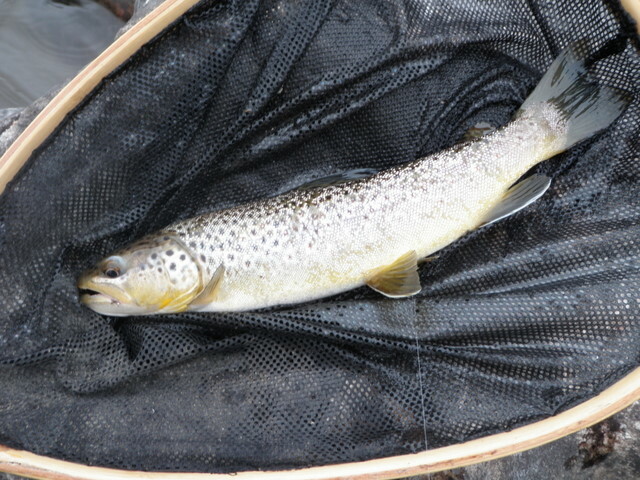 This brown was probably equal in size the the previous fish, and I quickly played it to the net. I meticulously dried the CDC wing and then attempted to catch the fish that had resumed rising sporadically across from me. I wasn’t seeing any BWO’s in the air, but did notice four or five midges buzzing about. Another fish rose across and below me near the tail of the long pool so I fired some long casts down and across, but this didn’t result in any hookups. Finally I gave up on the deep pool and hiked under the I70 bridge and crossed to the opposite bank where I climbed back up to the frontage road and returned to the car. The water on the other side of the bridge looked quite attractive, and I made a mental note to give it a try on a future trip. When we moved into our new house and had our backyard landscaped, we decided to include three 4’X4′ raised beds in the plan. Last summer for the first time since moving to Colorado I planted a garden. I had mixed successes and failures. My first attempt to grow pole beans was a roaring success, and Jane and I harvested numerous meals from four plants up until frost. We also enjoyed bumper crops of tomatoes and zucchini. On the downside, I planted the beets too close to the carrots, and consequently they got shaded out by the taller more vigorous carrots. The radishes bolted before developing radish bulbs, and I had decent scallions, but never developed large onions in the fall. 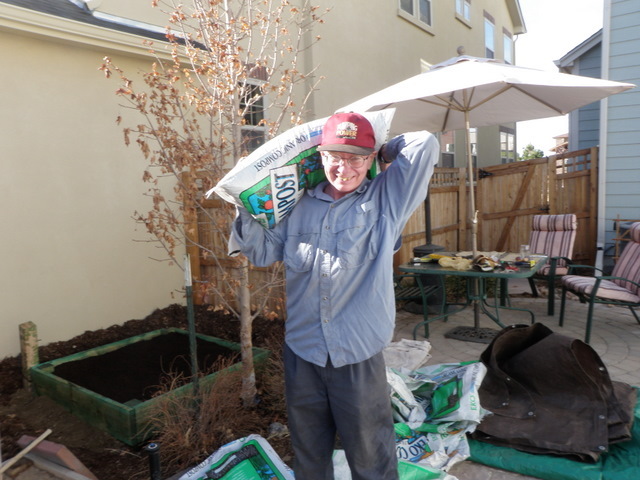 With the mild early spring weather we are experiencing in Colorado, I gambled and planted onions sets, radishes and spinach on March 11. This is approximately three to four weeks earlier than typically recommended. The weather forecast for the next week was mild, and I figured I was only risking relatively inexpensive seed. The gamble seems to have paid off as we had six days of unseasonably warm weather, then a couple cold days followed by another string of 70 degree days. Radishes, onions and spinach have all germinated before the end of March. Hopefully this will pay off with radishes and spinach maturing before the weather turns hot. 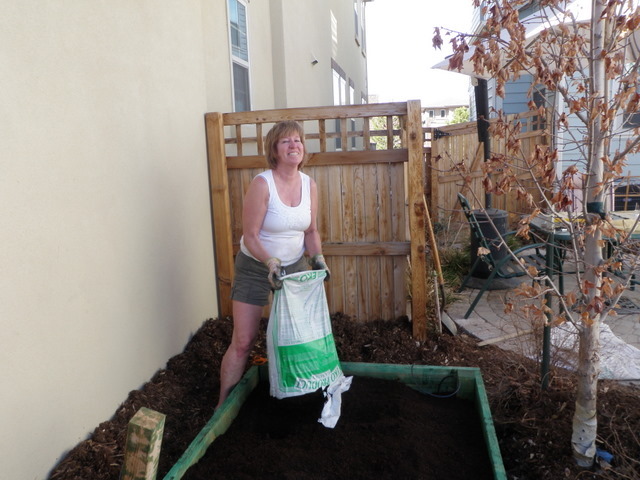 With a beautiful day on Saturday, Jane and I decided to work on the other problem; overcrowding and lack of space by building a fourth raised bed. We consulted with our neighbor Tom Romero, who told us how to tap into the irrigation system. We then recorded our measurements and made a materials list and headed off to Home Depot. Amazingly in one afternoon we applied wood preservative to the lumber, hammered together the raised bed frame, dug holes, anchored the corner posts, tapped in the sprinklers, and filled the raised bed with compost. We are now anxious to fill our new bed and spread out our plantings for the 2012 growing season. My fishing adventure took place on Sunday, but this saga begins on Saturday, St. Patrick’s Day. 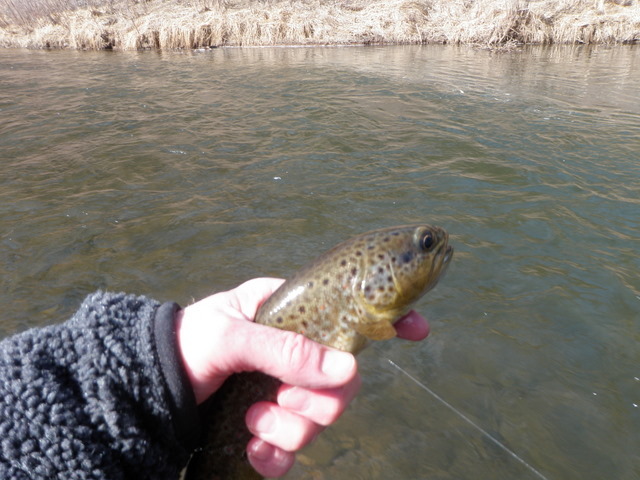 I receive a regular email from the Blue Quill Angler in Evergreen, and I noticed a presentation was scheduled for March 17 on fishing Clear Creek. Each of the last three seasons I’ve increasingly visited Clear Creek as it is probably the quickest location I can get to for an afternoon or evening of fishing. A young guide who operates out of Blue Quill Angler named Cody Scott made a great presentation and I recorded some helpful notes on places to fish that I haven’t explored yet as well as suggestions on technique and flies for the different seasons of the year. I’m quite anxious to put Cody’s recommendations to the test. I also received an electronic newsletter from Royal Gorge Anglers in Canon City. This shop is owned by Taylor Edrington, the fishing travel agent that I used for my Alaska trip and the same agent that Jane and I are using for a December trip to Argentina. Taylor’s recent email announced that his shop was moving from downtown Canon City to a new location along route 50 on the way to Royal Gorge, and he was having an open house on Sunday, March 18. Jane and I decided to check the new place out, so we packed up the car with fishing gear as well as Jane’s mountain bike and headed south. The plan was to stop for lunch in Canon City and then check out Taylor’s new shop. Jane would then drop me off along the Arkansas River and return to Canon City to ride her bike on the river pathway. As we drove west toward Canon City we noticed a thick haze over the river valley created by all the wind stirring up the dust. The dust was so thick that it made the sky seem like an overcast cloudy day. We stopped at a Subway in Canon City and picked up sandwiches for lunch and then drove a couple miles to the new Royal Gorge Anglers. Taylor was right inside the door, and Jane and I chatted with him a bit and browsed the store and left. There were a lot of people there, so we didn’t want to bother Taylor too long. Next I decided to fish in the canyon west of Royal Gorge and Parkdale so we headed west on route 50 to a nice long pullout just before the bend that precedes the Spike Buck access parking lot. Jane and I climbed down some rocks to a perch above the river and ate our lunch sheltered somewhat from the severe wind. The wind was so bad that Jane decided to remain near the car and read while I fished rather than battling headwinds on her bike. I gathered my fishing gear and prepared to hike up the highway a bit to a spot where the bank wasn’t as steep. 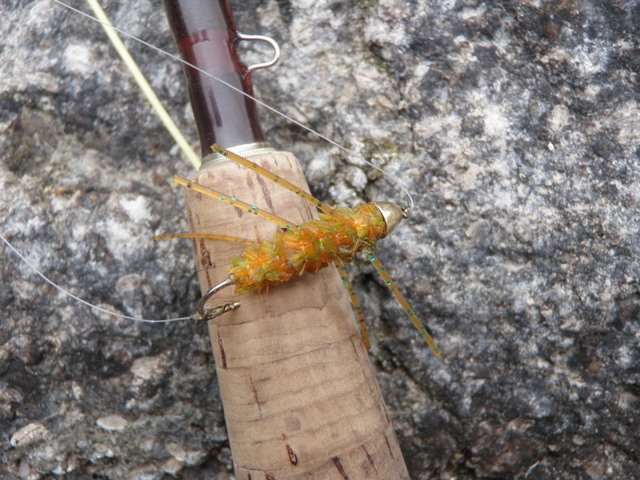 I descended to the river and decided to begin with a Chernobyl ant trailing a beadhead hares ear and beadhead RS2. 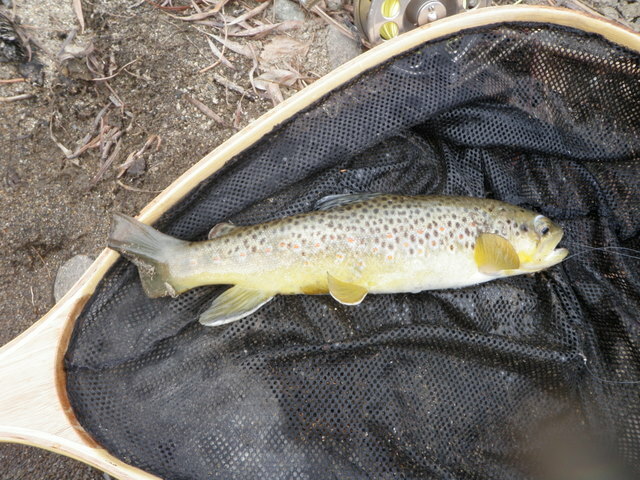 The Royal Gorge fishing report suggested going deep with golden stonefly nymphs, baetis nymphs and midge larva, but I wanted to try the dry dropper before dredging the bottom. I fished in this manner for perhaps half an hour with no success whatsoever, and I was having great difficulty punching 15 foot casts into the heavy wind. I decided to change strategy and went to a strike indicator and split shot above the BHHE and RS2. I began working the 10 – 15 feet of water along the bank and finally saw a pause and felt a momentary hook up at the tail of a deep run. While this was going on the sky was clouding up in addition to the layer of dust, and I thought I noticed an occasional BWO. I continued to cover quite a bit of water without any success so I decided to go with the store recommendation. I clipped off the beadhead hares ear replaced with an Arkansas rubber leg that I’d purchased in the spring of 2011. I only had one of this style of fly, but felt it would best imitate the molting golden stoneflies. I added the beadhead RS2 to the bend of the stonefly and began casting to the likely runs along the bank. It worked. In short order I nailed a brown as I began to lift my line and discovered that the first brown of the day had sucked in the RS2. Next I hooked another fish that was able to free itself in the current below me. But action was definitely beginning to pick up and in a slower moving area below some big boulders, the indicator paused and I set the hook and played in another brown that took the Arkansas rubber legs. For the next hour I moved fairly rapidly up the bank along the river making two to three casts to each likely run and in the process landed another six fish. They were mainly in the 9-11 inch size range with the last probably measuring out at a foot. Of the eight fish landed, three were tricked by the Arkansas rubber legs and the other five had the tiny RS2 in their lip. I also had a couple foul hooked fish and two long distance releases. Toward 4PM the sky got even darker and it began to drizzle as the wind continued to whip down the canyon. I released my last fish at 4:08 and hustled up the bank and returned to Jane for the drive back to Denver. Birthdays haven’t been something I look forward to since I turned 21. These milestones seem to fly by faster than telephone poles viewed from the window as one drives by. But I suppose there is no stopping them so why not jump on board and enjoy. A birthday is probably a fine excuse for celebrating life, spending time with family and loved ones and choosing to do something enjoyable. That’s what I did on Friday, March 16, 2012. Actually my birthday celebration began on Thursday evening when Dan joined Jane and I for dinner at the Phoenician Kabob, one of my favorite restaurants in Denver. Dan had a busy day on Friday as he prepared to depart for Tanzania. Dan’s gift to me was special; he paid for my wellerfish url for the remainder of the year so you readers can look forward to a continuation of my ramblings. 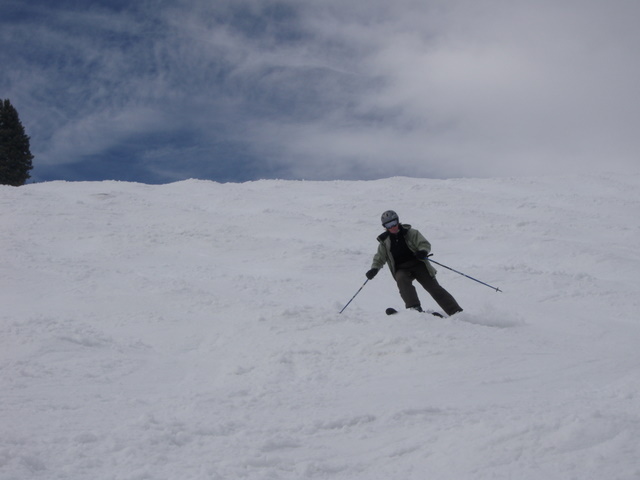 With the early spring weather in Colorado I chose to spend Friday with my lovely wife skiing at Vail. I actually love the time of my birthday as there are so many things to do. Spring skiing is always fun, baseball is beginning to kick in, March Madness is in progress, bulbs begin to bloom, and fishing can be decent. Friday was definitely my best skiing day of the season so far. Temperatures were probably in the fifties on the mountain so there were no cold hands or feet to deal with. Once the sun got high in the sky, the hard crusty snow softened to the consistency of mashed potatoes in places where direct sunlight pounded the brilliant white surface. My highlights on the day were skiing moguls in Sun Up Bowl and then navigating some more massive soft moguls on Genghis Kahn in China Bowl. Second was sharing lunch with Jane at Los Amigos at the base in Vail Village. Since it was a weekday we were able to get a table without waiting and soak up the sun while enjoying Mexican fare. 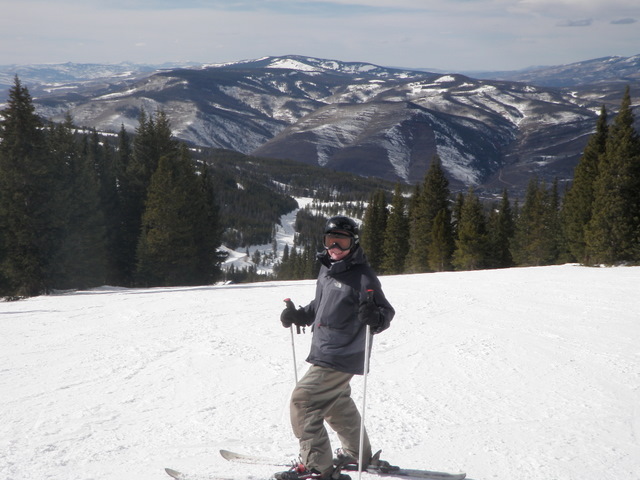 After we returned to our house from skiing the temperature in Denver remained over 70. Jane and I enjoyed a Lefthand Milk Stout on the patio before some clouds rolled in and forced us inside. Jane prepared one of my favorite meals for dinner, salmon wrapped in pancetta and grilled over charcoal. I suppose birthdays aren’t that bad after all. Would all you readers agree that a ten fish day on March 13, the first outing of the season, is a great day? Somehow the accomplishment felt cheap, but you’ll have to read on to understand. High temperatures were forecast to be 75 degrees in Denver so I made a spur of the moment decision to take the day off and head to the South Platte River downstream from Deckers. I checked the flows and they were in the low 200’s, and that is pretty nearly ideal for the South Platte in that area. 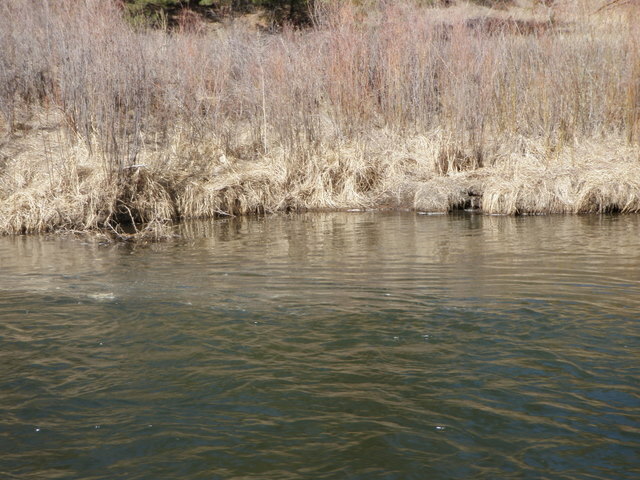 I checked a report, and it said the water was clear and unaffected by snow melting at the lower elevations. I took my time getting ready in the morning as I knew the air temperatures would be rather chilly until late morning so there was no need to be there early. I created a fishing packing list on my iPhone in hopes that it saves me from forgetting a critical item on future trips. The Santa Fe was out of the garage by 8:45 and I was on the water fishing by 10:30AM. As I suspected the air temperature was in the low 40’s when I began so I wore my Adidas pullover and a fleece layer on top of that. I parked the car in the Whale Rock area and hiked down the road a bit and then down the steep bank to my traditional first day starting point just above a steep cascade among the many large boulders. I decided to go back to my historical South Platte workhorse combination of a pink San Juan worm and beadhead pheasant tail. I worked the nice deep eddy in front of me, but despite some great drifts didn’t connect with any fish. I clipped off the pheasant tail and replaced it with an orange scud and moved upstream. It didn’t take long before I snagged on the bottom and in my efforts to extract the flies, I snapped them both off. I only had one more pink worm with me, and it wasn’t producing so I plucked a beadhead hares ear from my patch and below that I tied on a teal baetis nymph. Again I began to work the water upstream to the large bend and eddy just below the parking lot. The river at this point deflects off the far bank and then slowly rolls through a fairly deep hole with a small slow moving eddy and surface foam between the hole and the bank. I spotted a sporadic rise in the foam, but decided to stick with the nymphs before going to a dry. I didn’t see any blue wing olives on the water, but did spot the occasional midge, so I assumed the fish were sipping midges in the surface foam. I clipped off the teal baetis nymph and replaced it with a tiny dark olive midge larva. This fly is about as basic as it gets with dark olive thread for the body and a fine silver rib and a silver bead. I drifted the nymphs along the seam and on the fifth drift the indicator made a subtle pause. I thought I was hung up so I lifted the rod and was surprised to feel a tug. I played the fish for a bit before it released itself downstream. I cast again and sure enough saw another pause and set the hook harder this time and landed a small brown. This was the first fish of the season so I snapped a couple photos even though I was too far from the bank to position it on my net as I normally do. The next hour proved to be a great introduction to 2012. I kept running the two fly nymph combination through the deep run and along the seam and landed another nine fish. They were all browns in the 9-11 inch range, and they were mainly taking the tiny midge larva fly. Perhaps two fell for the beadhead hares ear. One of the last of the ten probably extended to around a foot and I photographed this one on my net on the bank below the parking lot. Meanwhile the cruisers continued to sip something very small in the eddy across from the subsurface action. At noon the action slowed and by now my feet were numb from the ice cold water. I decided to head back to the car and eat lunch and warm up my feet. After lunch I eagerly anticipated testing the two flies on different stretches of the river, so I wandered upstream a bit to an area with huge boulders and numerous large deep pockets and runs. This water was slightly faster than the bend pool. I managed one temporary hookup, and saw another decent fish follow my flies as they did a swing at the end of the drift, but failed to take. I moved on above the last large boulder and attempted a few casts where the water cut deep in front of the boulder, but again no action. 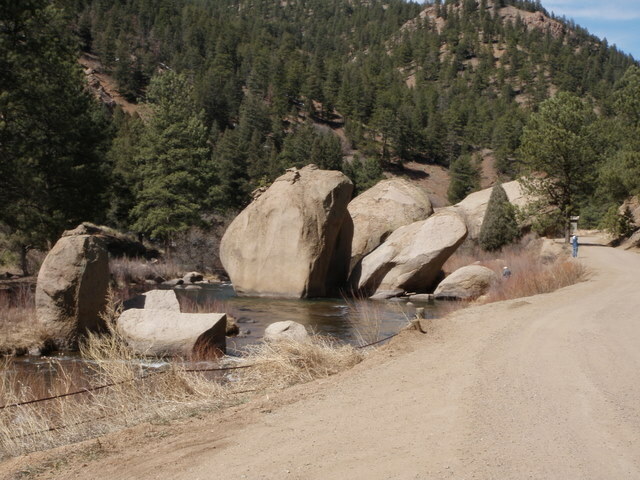 I returned to the car and drove to the next U-shaped parking lot above the large boulder area. From here I hiked up the road to the rock garden area that has always produced for me in past trips. Unfortunately Tuesday was not going to be one of those days. I cast to all the likely areas with no success and didn’t even spot a fish. When I reached the end of this stretch of water, I returned to the car and decided to drive to the upper special regulation water just below Deckers. I parked in a lot just beyond the town of Trumbull and hiked down the path and then fished upstream to the large bend where I encountered another fisherman. I spent an hour in this water and spotted one fish. I worked my nymphs deep through some juicy holes and runs to no avail. When I spotted a small fish and it didn’t respond to my nymphs, I decided to try a dry dropper and tied on a yellow Charlie Boy hopper trailing a beadhead RS2. This didn’t work either and I continued fishing this combination upstream through some nice water for the next 15 minutes. When I encountered the other fisherman blocking my path upstream I decided to move one more time. I returned to the car and drove up the road around the bend to the next pullout. But it was now 3PM and my heart was no longer in it, so I removed my waders and drove back to Denver. Ten fish on my opening day is a great story, but I’m disturbed by the fact that I caught them all in the same place over a one hour period and couldn’t land a fish anywhere else. Perhaps the fish are still schooled in ideal winter holding locations, and I didn’t manage to find any more of these spots? The fishless afternoon certainly destroyed the confidence I built up from 11-12. 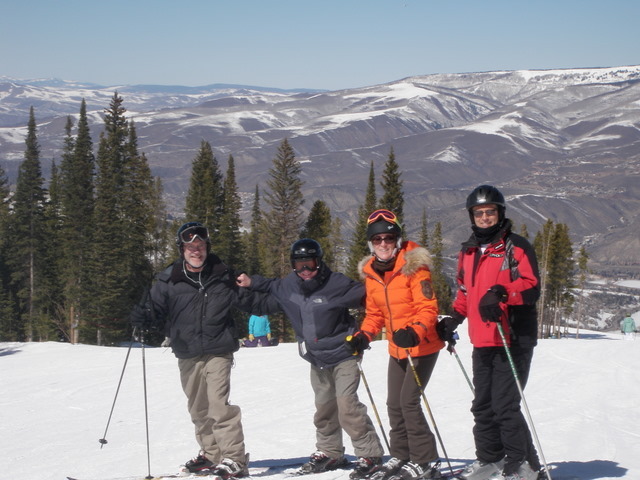 March 9-11 represented the final weekend of our Dillon condo rental and coincided with Jane’s sister and brother-in-law staying at the Ritz Carlton Bachelor Gulch, so we planned to meet them on Saturday for a day of skiing. In addition Jane and I invited our friend, John Broadbent, to join us. John decided to drive up to the condo on Saturday and meet us, and then spend the rest of the day skiing at Beaver Creek and hanging out with the Vogels. The weekend began with a call from Dan saying he was in the Stapleton area after picking up his bike at Cycleton, and wondered if we’d like to meet him at Casey’s for a beer. We agreed and made a quick trip to the Stapleton Town Center where we met Dan, and he had put his name on the list for a table. While we waited for a table, Dan’s roommate Loren stopped by. She works promoting beverages for Diageo as a second job, and she was handing out an Irish beer made by the same company that makes Guinness stout. Jane and I each had a Guinness while we waited and Dan drank one of the freebies offered by Loren. While consuming our drinks our table opened up, and we enjoyed a casual dinner at Casey’s. After dinner Jane and I hustled back to the house and gathered up our things and drove to the condo in Dillon. We got a later start than normal, so didn’t have much time to relax before crashing ahead of our expected long day on Saturday. On Saturday morning we awoke and Jane began preparing breakfast. John was due to arrive between 8 and 8:30AM, so I called him to check his whereabouts at 7:45, and we discovered he was less than 15 minutes away, so we waited for him to join us for breakfast. After breakfast we hit the road and drove over Vail pass to Bachelor Gulch and met the Vogels and guests at their condo. The valets parked our car and transported all the ski gear to the ski exit area at the club. 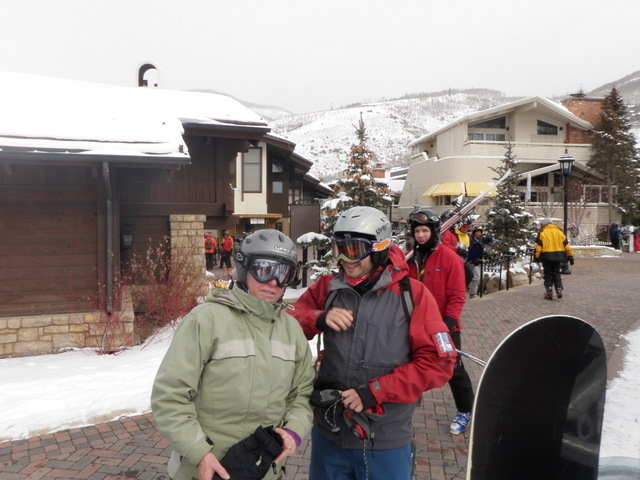 Judy and Bill were preparing to ski, so we waited and eventually were on the slopes by approximately 10:30AM. We did a couple runs in the Bachelor Gulch area and then headed to Arrowhead for two more warmups. 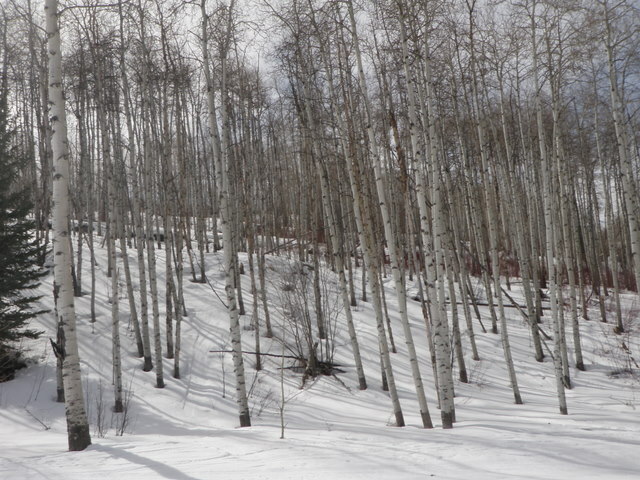 Next we angled across the mountain to the main Beaver Creek area and did a bunch of runs before ultimately working our way to the far eastern end. Here we did Ripsaw and rode the new high speed quad out of the Rose Bowl. We again worked our way back across the mountain until we finally skidded back to Bachelor Gulch and returned to the Vogel’s condo for lunch. Bill was done for the day as he wanted to watch the Florida State vs Duke ACC playoff game. John, Jane and I put our ski gear back on and returned to the slopes and decided to head straight to Grouse Mountain and get a few black runs in before the lifts closed. We did in fact manage to descend Grouse Mountain twice before the lift shut down, and then went up Larkspur and angled back to Bachelor Gulch by 3:45PM. The two runs on Grouse Mountain were my favorites with some huge moguls conquered by John and me. Jane did the ultra steep groomer right next to the mogul field. It was a beautiful ski day as the sun was bright all day, and the snow softened up nicely, but not to the point of heavy mashed potato consistency. 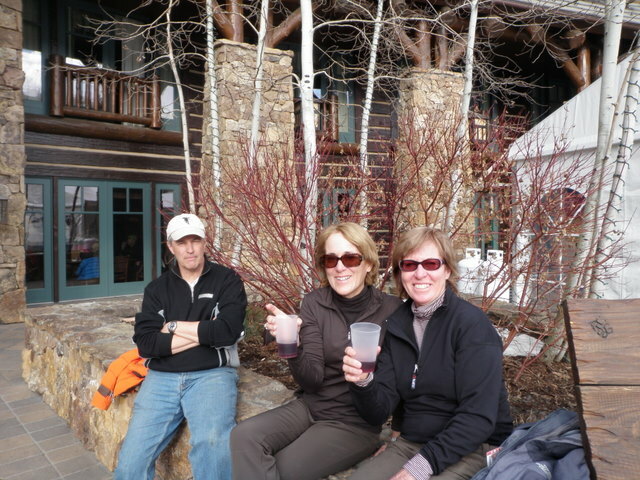 After getting our skis and boots back to our car in the valet parking lot, John, Jane and I migrated to the Ritz Carlton Hotel base for apres ski festivities. A guitarist was playing southern rock tunes, and the fire pit was flaming, while other skiers were basking next to the pool in their swimwear. It was a strange juxtaposition of swimmers and skiers. Bill and Judy grabbed seats along the wall on the far side of the patio, and we all immediately shed several layers of clothes while we drank a beverage and listened to the entertainment. After a bit, Chris and Jenny joined us in their T-shirts and shorts. Eventually we headed back to the condo and put on our swimsuits and then went down to the first floor and out to the hot tub. We had the entire hot tub to ourselves and while soaking could watch the end of the Arizona vs CU PAC-12 championship game that was eventually won by CU. After our soak, Jane, John and I took showers in the locker rooms adjoining the ski storage area. We agreed to meet by 6:30 in order to be in a position to drive to Ti Amo, the restaurant where we had reservations for 6:45. Eleven of us feasted on great Italian dinners and then John, Jane and I said our goodbyes and returned to our condo for the night. On Sunday morning we were up at our normal time of 6:30, but soon remembered that we made the switch to daylight saving time, so it was actually 7:30. We had another tasty but quick breakfast and packed the car, returned the key, and headed back to Denver. After unpacking at home, Jane and I went for a long walk. When I returned I assembled our new Yakima bike rack that fits on the RAV spare tire, while Jane did some yard cleanup in the backyard around the patio. I interrupted Jane to ask if she’d like to go to Home Depot to buy seeds for the garden, and she agreed, so we biked there. Jane guarded the bikes while I purchased some radish and spinach seeds. My top priority was to buy onion sets, but they weren’t stocked yet, so we biked back to 9026 35th Avenue and jumped in the car and drove to City Floral where I purchased a mesh bag filled with yellow onion sets. When we returned to the house, Jane finished cleaning up the corner of the patio while I planted onions, radishes and spinach. 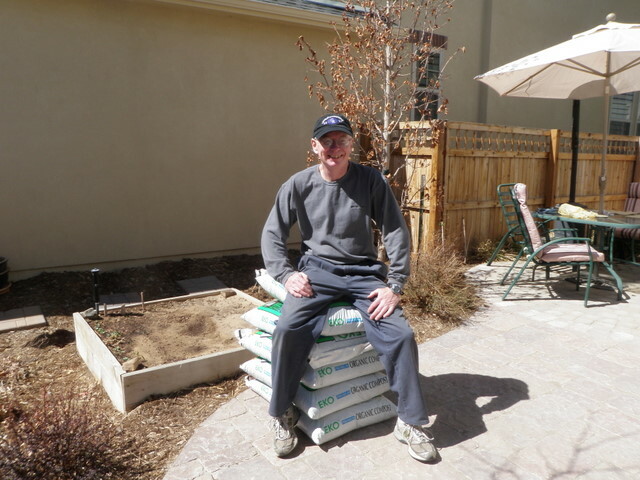 Denver is supposed to experience a week of weather with highs in the 60’s, so I’m hopeful this will enable the seeds to germinate ahead of a likely return to cold winter weather. 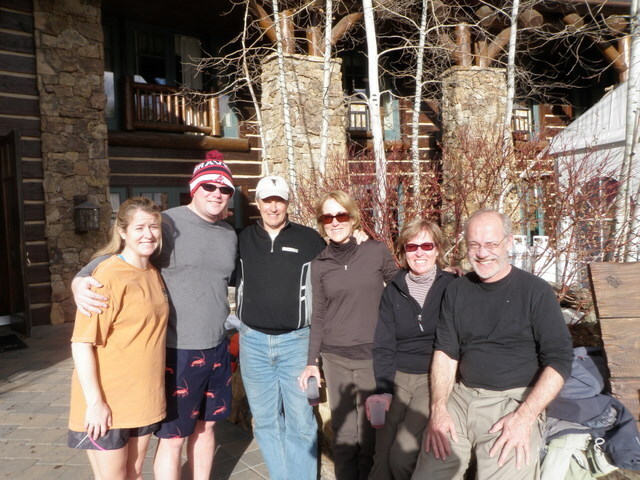 Amy, Dan and friends Brady and Kara were meeting in Park City, Utah for a long weekend of early March skiing. This left their friend Kirk behind in Denver studying for medical school exams, so Kirk decided to join Jane and I at our condo in Dillon again. We also thought we would have Karen and David Gaige with us again, but they couldn’t find dog sitters and declined our invitation at the last minute. Kirk stopped over to our house on Friday night and prepared a wonderful dinner consisting of eggplant curry. Jane and I loved it and were fortunate enough to own leftovers that will be consumed on Sunday night. After dinner and clean up we packed the Santa Fe and departed for Dillon. We left at 7:15PM and arrived at the condo by approximately 9:30 after picking up the keys in Frisco. We decided to visit Vail on Saturday and crashed relatively early in anticipation of a day of skiing. On Saturday morning after a great breakfast of waffles and berries, we set out for Vail. Vail pass was a bit treacherous and we passed several accidents which added to our angst; however, we avoided negative incidents and arrived at the Vail parking facility, put on our ski boots, hiked through Vail Village, and rode two chair lifts to the summit by 10AM. It was quite cold with the Sante Fe thermometer registering 0-3 degrees and the wind was blowing quite strong off and on. 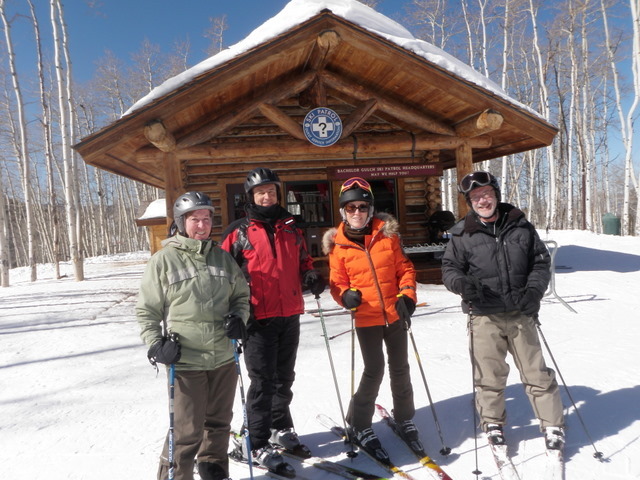 The three of us spent most of the morning in the back bowls before arriving at Two Elks Lodge for lunch by 11:30. After lunch we headed to China Bowl and then up the chair to Blue Sky Basin. Little Ollie was perhaps our favorite run of the day with the sun peeking out occasionally and medium sized soft moguls to maneuver over and around. Because of the frigid temperatures and wind chill, Dave was experiencing severely cold feet which forced an end to the day of skiing by 3PM. After climbing Vail pass we returned to the condo for some appetizers and then dined at our favorite haunt in Silverthorne, Murhpy’s. Murphy’s seems to be the one establishment that doesn’t get crowded and require long waits. On Sunday morning we all awoke early and decided to truck back to Denver for breakfast ahead of traffic. This strategy worked extremely well, and we were only held up for a brief closing of the Eisenhower Tunnel while three trucks carrying hazardous material passed through. Kirk joined us for a tasty breakfast and then took off to do more studying. 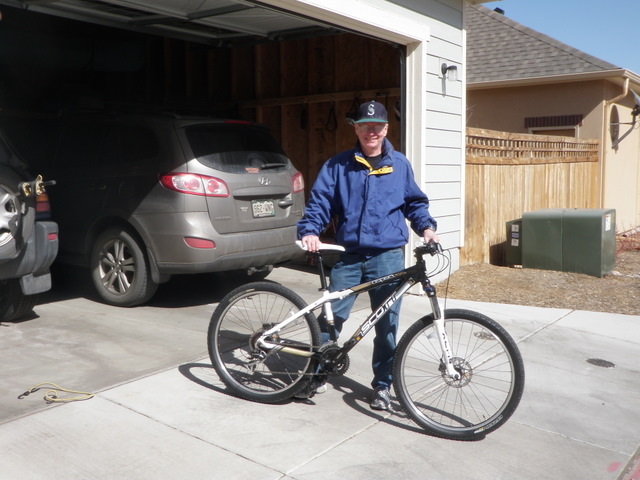 In August of 2011 Dave had his mountain bike stolen while locked to a bike stand with a cable lock outside the Colorado Athletic Club on Welton Street. He received a flyer in the mail about a massive bike sale at the Bicycle Village in Aurora, so Jane and Dave drove south to the sales event. A large tent was erected over the parking lot and after inspecting a couple bikes, Dave purchased a Scott mountain bike. In addition Jane and Dave bought a Yakima bike rack that fits over the spare tire on the RAV. This rack normally costs $180, but with the 50% off coupon received in the mail, was purchased for $90. In addition Jane found some nice deals on apparel. We returned home satisfied with our purchases and given the beautiful air temperatures in the 50’s couldn’t wait to try out the bike. 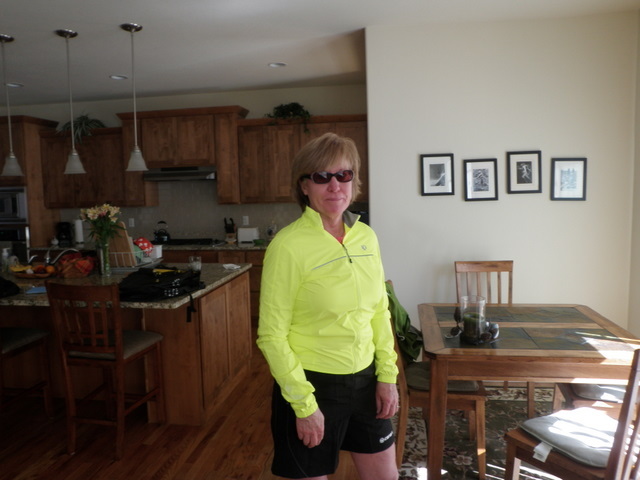 Jane wore her new shorts and windbreaker, and we did a 1.5 hour bike loop around Central Park in Stapleton and City Park next to the Denver Zoo. 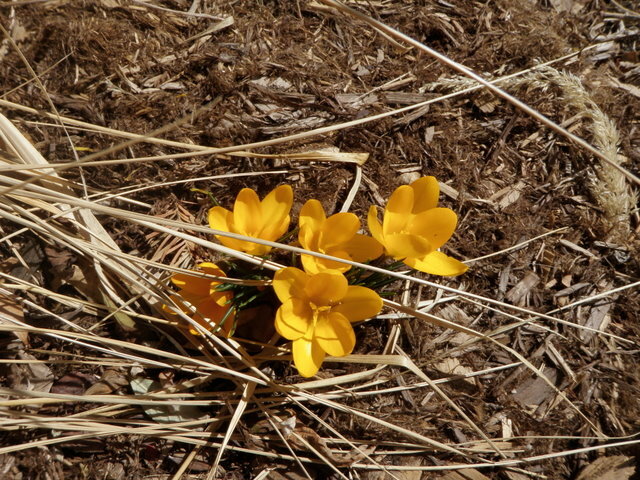 The bike ride and the appearance of crocuses in the back yard made us both anxious for the approaching spring in the Rocky Mountains.